The app, called On This Spot, allows people to go on self-guided walking tours and compare current buildings and places with historical photos. As Winnipeggers hungry for history head out this weekend for Doors Open Winnipeg, a new smartphone app will offer a window into the city's past. The annual Doors Open event gives people a chance to step inside buildings not always open to the public. While they do that, a new app called On This Spot will also let them go on self-guided walking tours and compare buildings and places with historical photos of what they used to look like. 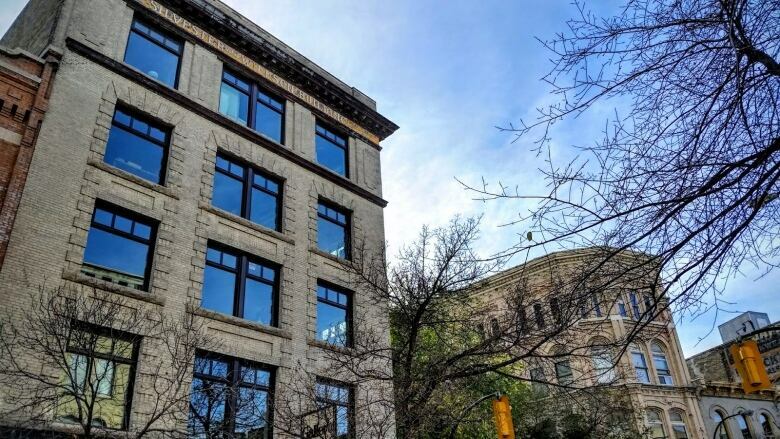 Currently, the app — which is free to download and available for Android and iOS phones — focuses on Winnipeg's Exchange District, which contains nearly 130 heritage buildings within 20 blocks. "So it gives not only visitors, but Winnipeggers, a really sort of in-depth way to learn on their own time about our history in the Exchange — because the Exchange, as you know, is the most historic area for our built heritage in the city of Winnipeg," said Cindy Tugwell, executive director of Heritage Winnipeg, one of the driving forces behind the app. Tugwell hopes the app will help boost tourism in the city. "You look at these historic cities all over the world, it's such a tourism hub, these cities that keep their built heritage. It tells us who we are," she said. Currently, people can view around 100 now-and-then photos sets, all specific to the Exchange District. The app will gather analytics on how it's used and which sites prove to be the most popular, which will then be used to expand into other areas of the city, Tugwell said. "We want to say, 'what are people thirsty for?' But I think starting in the Exchange, where Winnipeg's history really started, is the most appropriate," she said. Winnipeg is just the latest city to make use of the On This Spot app. Nine other Canadian cities are already included, such as Victoria, Vancouver, and Strathmore, Alta.